Climbers above basecamp on Dhaulagiri. Photo by Dan Mazur, Fredrik Johansson. TODAY’S TWEET FROM EXPEDITION LEADER DAN MAZUR: DHAULAGIRI TEAM BACK DOWN TO ROAD SAFE. NOW DRIVE TO KATHMANDU. WATCH WWW.SUMMITCLIMBNEWS.COM FOR NEW PHOTOS, VIDEO, & STORIES. 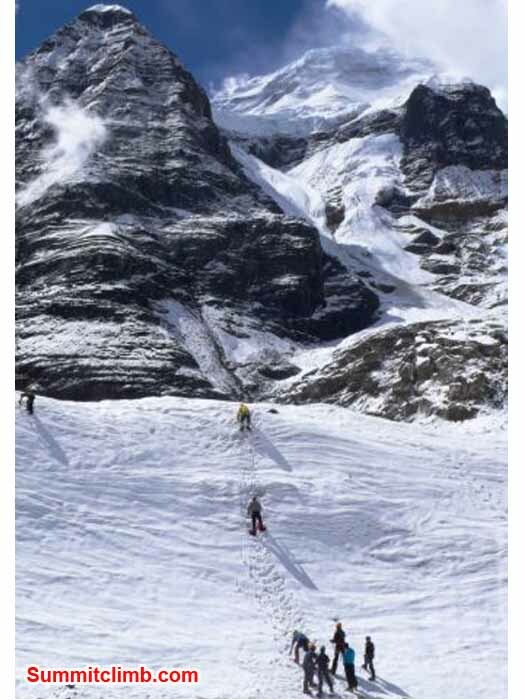 TODAY’S TWEET FROM EXPEDITION LEADER DAN MAZUR: WWW.DHAULAGIRINEWS.COM TEAM WALKS ACROSS FRENCH PASS & DAMPHUS PASS TO YAKARKA @ 4200 M / 13,779 FT. GORGEOUS! 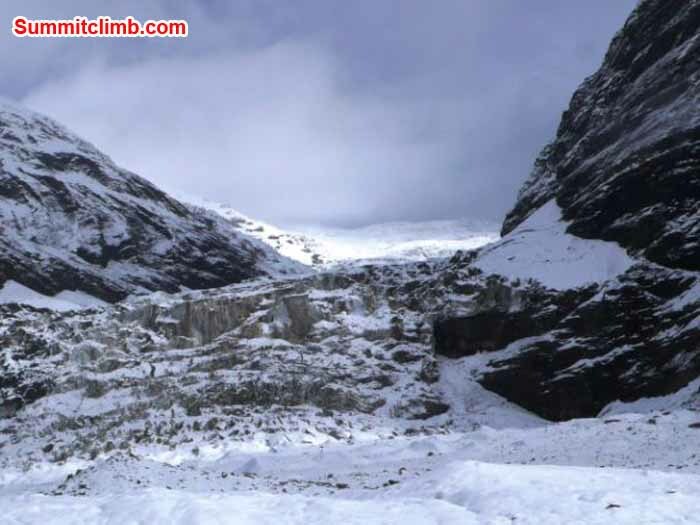 TODAY’S TWEET FROM EXPEDITION LEADER DAN MAZUR: WWW.DHAULAGIRINEWS.COM TEAM ALL BACK DOWN SAFELY IN BASECAMP. TODAY IS OUR LAST DAY IN THIS BEAUTIFUL CAMP. 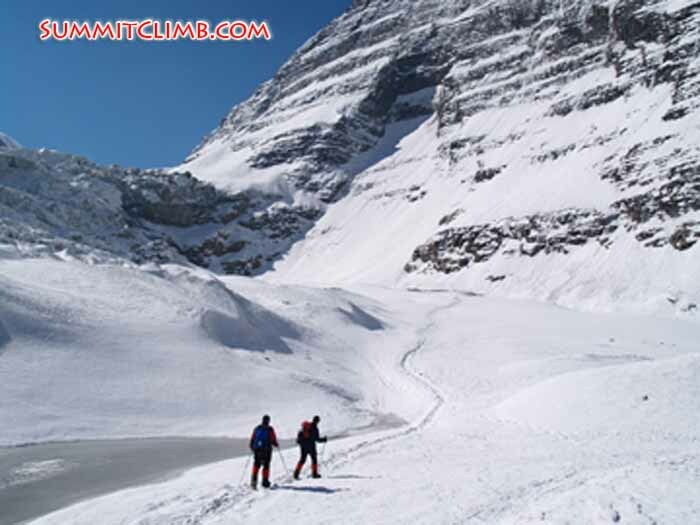 Team climbs above the Deposit Camp at 5085 metres - 16,679 feet. Photo by Arnold Coster. 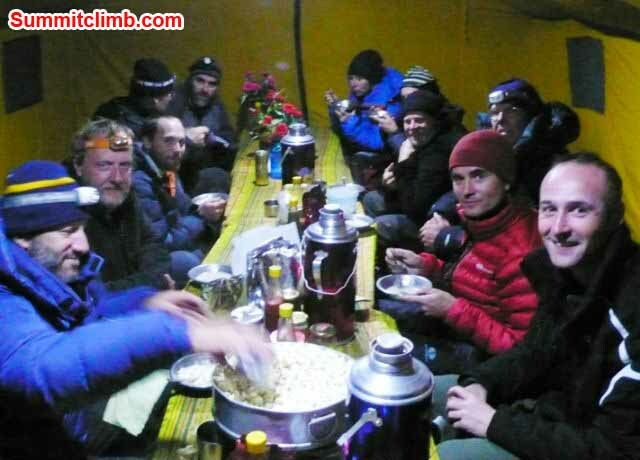 TODAY’S TWEET FROM EXPEDITION LEADER DAN MAZUR: DHAULAGIRI TEAM REST DAY IN CAMP 2 @ 6553 METRES / 21,50@ FEET. GOOD WEATHER. SHERPAS NEED TO FIX MORE ROPES FOR SAFETY. TODAY’S TWEET FROM EXPEDITION LEADER DAN MAZUR: WWW.DHAULAGIRINEWS.COM TEAM HEADING FOR SUMMIT. NOW IN 5800 METRE / 19, 000 FOOT HIGH CAMP 1. HEADING FOR C2 NEXT. 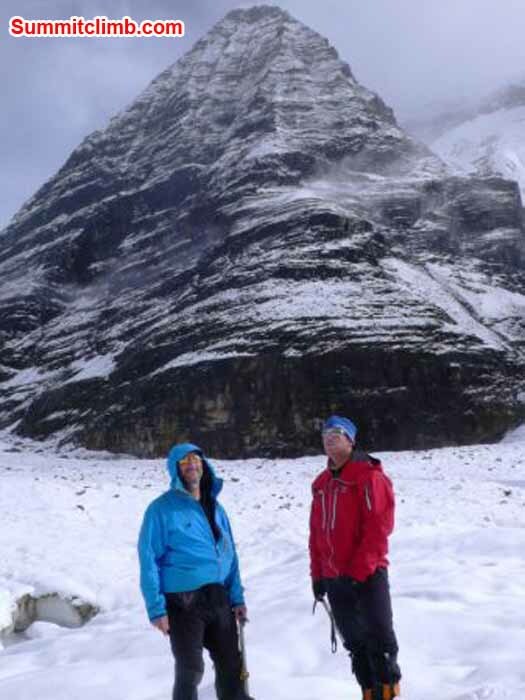 The first week after the team's arrival at Base Camp, the weather was anything but favorable. A steady rain fell, occasionally giving way to snow that landed more or less as slush. 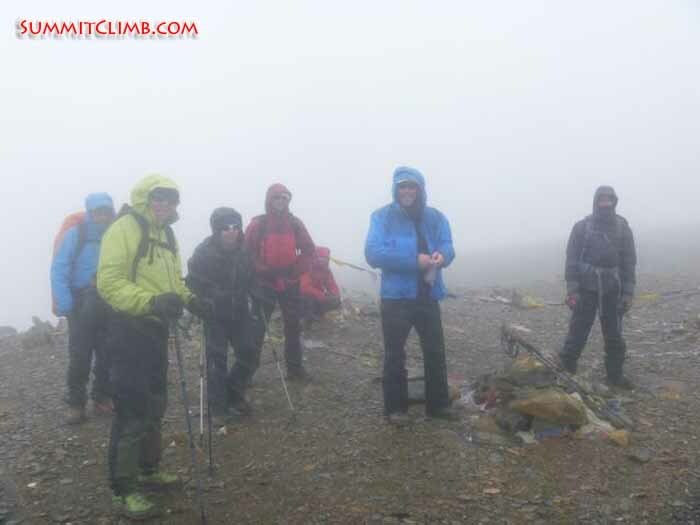 By the time the team began its initial climb onto Dhaulagiri, time had been lost due to the weather, thus a more special acclimatization schedule seemed to be called for, in order to make up for lost time. With this in mind the team departed Base Camp (4650 meters / 15,252 feet) at 0500hrs on the morning of the 21st and began a steady climb towards Depot Camp (5100 meters / 16,728 feet) across rock, snow and ice with the team all complete in location by around 1000hrs. The following morning, the 22nd, the team departed Depot Camp at 0600hrs and crossed the upper Dhaulagiri ice fall to reach Camp 1. (5850 meters / 19,188 feet) with the team complete again by 1300hrs. The next day, the 23rd, was taken as a rest day to allow the team to acclimatize further before a push to Camp 2 at 6560 meters / 21,517 feet. were barely halfway up the mountain with still a long way to go. total of 1910 meters / 6265 feet vertically. 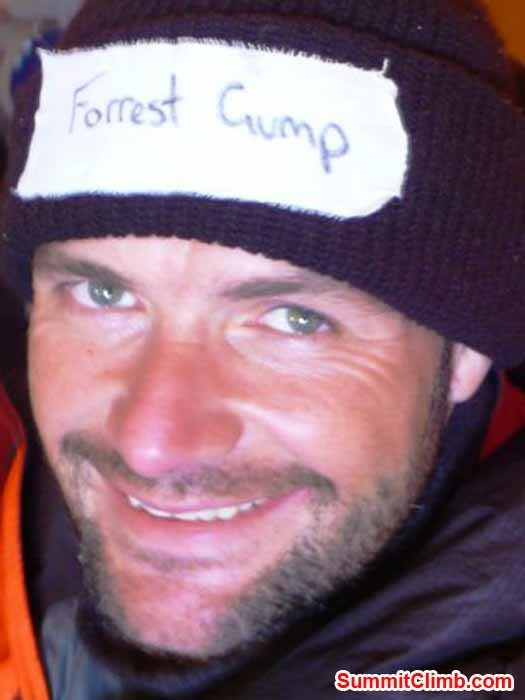 After such a gain, the effects of altitude experienced by some at Camp 2 can be completely expected. office via satellite messaging service, the 2nd of October could be a good day to climb to the world's 7th highest summit, Mount Dhaulagiri. Last but not least, the unfortunate events that occurred in the tragic avalanche on Mount Manaslu, the world's 8th highest peak, located in Nepal, need to be mentioned. All of us at SummitClimb send our thoughts and condolences out to the injured and lost fellow climbers, their families, friends, and colleagues. As a side note, the mountain our SummitClimb team is attempting, Mount Dhaulagiri, sits at quite some distance away from Manaslu and our local weather and snow conditions are quite different and apparently considerably more stable. TODAY’S TWEET FROM EXPEDITION LEADER DAN MAZUR: WWW.DHAULAGIRINEWS.COM TEAM DESCENDS TO CAMP 1 @ 5800 M / 19,024 FT. TOMORROW RETURN TO BASE CAMP. WEAT HER PERFECT! Camp 2 in the early morning after a snowstorm. Tukuche Peak in background. Elevation circa 6700 metres - 22,000 feet. Photo by Arnold Coster. The Dhaulagiri Glacier seen from above. Basecamp lies on the medial moraine in the background. Photo by Slavomir Fila. 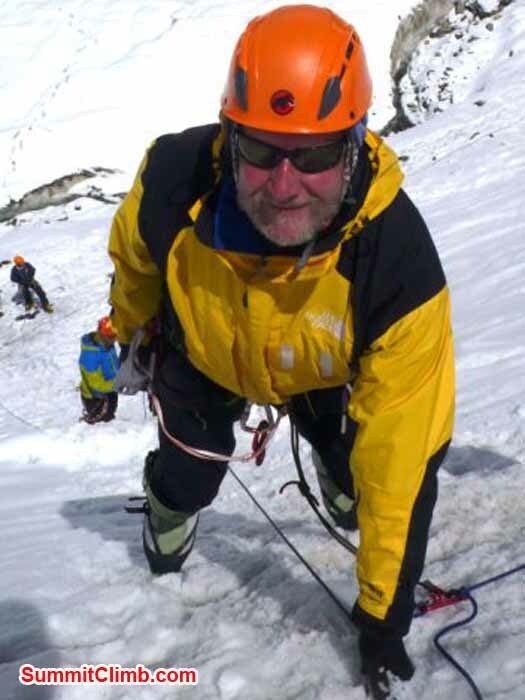 Hello SummitClimb News this is Arnold Coster; the leader of the Dhaulagiri expedition calling from camp 2 at about 6,516m and today is Monday 24th of September. We had a hard day climbing up here; it’s a long way up from camp 1 to camp 2 but all members made it up here and in reasonable time. It’s a nice camp with some nice views of Machu Pichu and Anna Purna 1 and it’s a pretty amazing place here. Yesterday we had a rest day in Camp 1 at about 5,850m, we’re trying to make up some time because when we arrived in basecamp we had a long period of bad weather so we’re trying to catch up now and I think we’re catching up well. Unfortunately today we got some bad news from Manaslu, we heard that some climbers got killed in a huge avalanche our thoughts are with the families of the injured and the victims. I also want to let you know that Dhaulagiri is very far away from Manaslu so don’t worry we are on a completely different mountain. 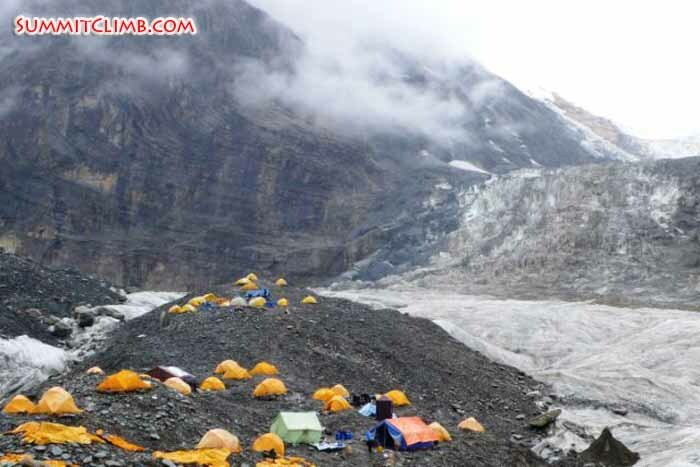 Tomorrow we will go back down to camp 1 again and the next day we will probably go back down to basecamp for some rest. TODAY’S TWEET FROM EXPEDITION LEADER DAN MAZUR: DHAULAGIRI TEAM REST @ C1, 5800 M / 19,000 FT. TEAM MEMBER JERRY GLADH PHONED HOME TO DISCOVER HE IS NEW GRANDPA TO 3.9 KG / 8.6 LB BABY. Hey this is the dispatch for 21st & 22nd September. On the 21st we walked from basecamp to the departed camp at 5,081 meters, we left in the middle of the night and got up there around 9:30 or 10:30 in the morning. On the 22nd we walked up to camp 1 at 5,800 metres leaving at 6am and arriving between 10:30 and 12:30. Everybody’s up here, we’re doing good and there are amazing views up here and we’re finally getting some good weather. 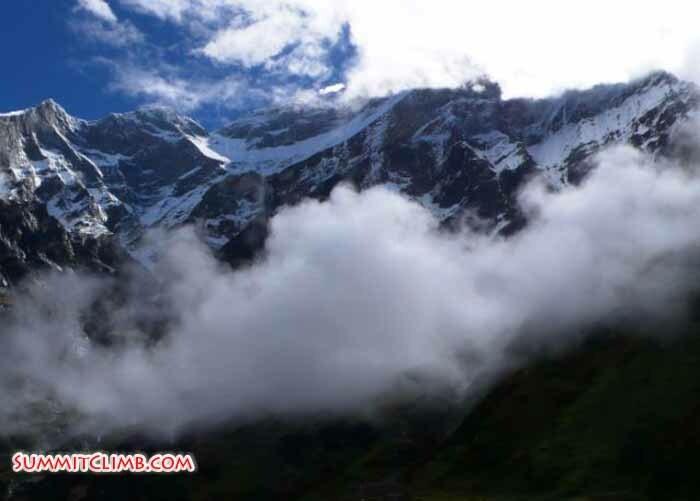 It’s a little bit cloudy right now but we can see some blue sky and it gets hot every afternoon and we’re hoping to take a rest day on 23rd September and maybe go up to camp 2 on 24th September, the Sherpa’s are working on the route right now. 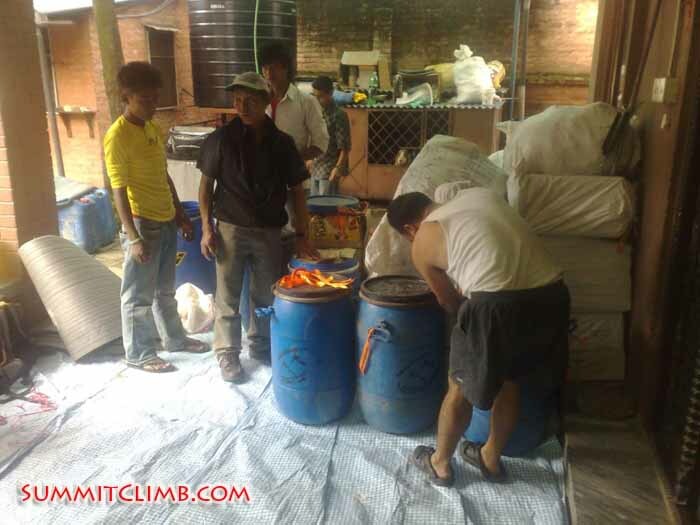 TODAY’S TWEET FROM EXPEDITION LEADER DAN MAZUR: DHAULAGIRI TEAM REACHES DEPOT CAMP AT 5086 M / 16,682 FT. EVERYONE OK. RESTING NOW, WISH US LUCK TOMORROW 4 WALK 2 C1. WEATHER CLEAR IN A.M.
TODAY’S TWEET FROM EXPEDITION LEADER DAN MAZUR: TONIGHT. 4 AM. JOURNEY TO CAMP 1. Hello, This is Matt Belman writing on a spectacular sunny morning from Base camp. The team is feeling strong and the monsoon seems to be going away. 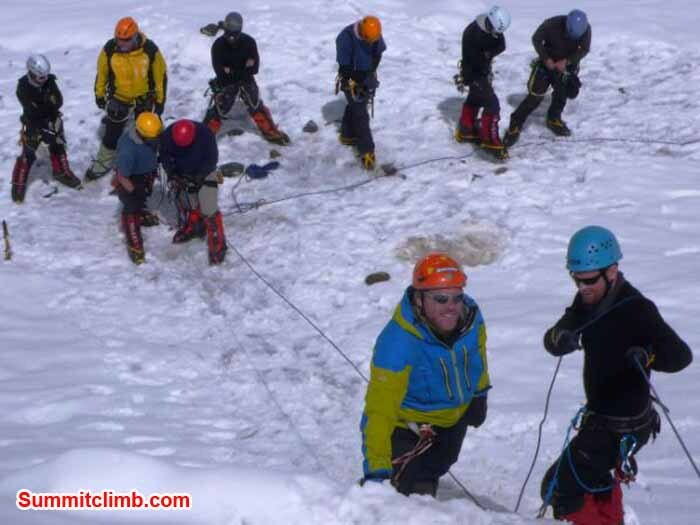 Yesterday we had fun training on the glacier getting tuned up on our rope safety skills and crampon use. A few days ago we acclimatized up at French pass with a few hikes and a lot of cloud, rain and snow, testing our route finding skills. We have been entertaining ourselves with a few games of cards, yahtzee and a guess who I am game which has brought us to hysterics. 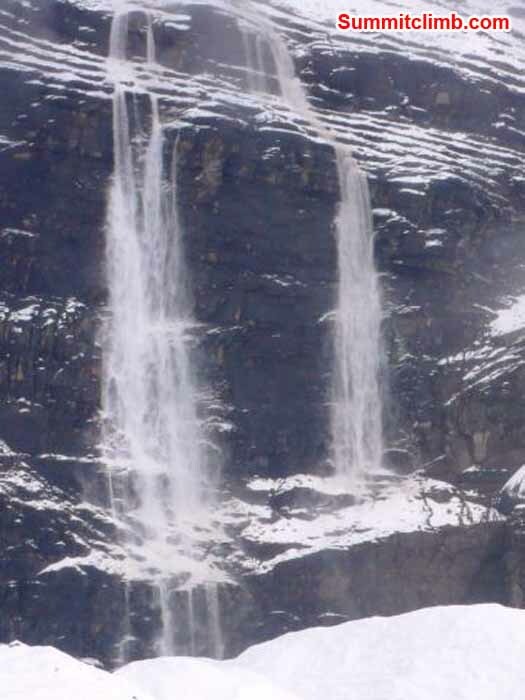 We are surrounded by spectacular peaks and ice falls and a geologists dream of rock strata. A few animals are about, rabbit, we think and pesky clever and hungry ravens. Fortunately, we are sharing the mountain with only the Spanish team. Tomorrow we plan to head up the ice fall to depot camp and the next day for camp 1 .We all send our best to family and friends. 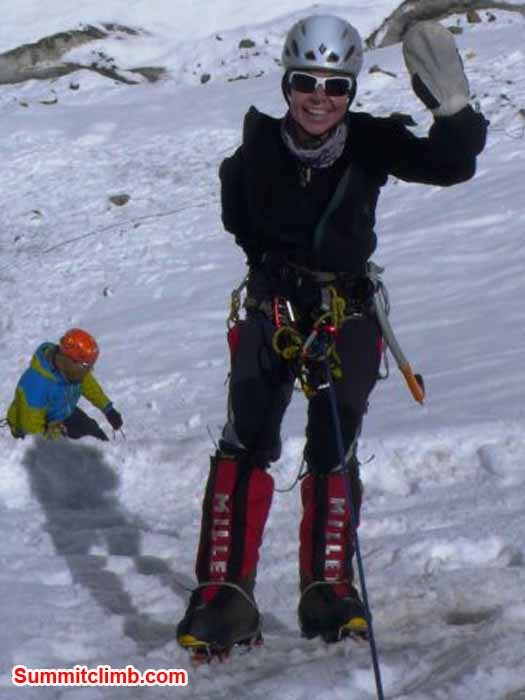 Thanks for following Summit climbs Dhaulagiri 2012 NE rib climb. TODAY’S TWEET FROM EXPEDITION LEADER DAN MAZUR: AFTERNOON SUN HIT BASECAMP & SURROUNDING PEAKS. WE EXPLORED NEW SNOW ON SURROUNDING GLACIERS. TONIGHT STARS ARE OUT. 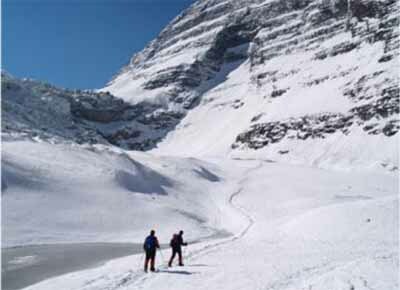 TOMORROW GLACIER TRAINING. At the moment we are living in a very small world. It's cloudy, rainy, snowy all at the same time and we are just able to see a few meters around us. It's like we are living inside a ping pong ball! This morning we went for an acclimatization hike with the whole team to the French Pass. A few of us scouted the route out a day before, so it was not too hard to find the way this time, even in total white out conditions. We put a lot of extra cairns on the route, this way it's easy to find the way back and the next group who passes by here has no route finding problems either. On the French pass the wind was hauling and it was snowing horizontal, not very nice, so we decided to head down to our high camp again and call it a day. 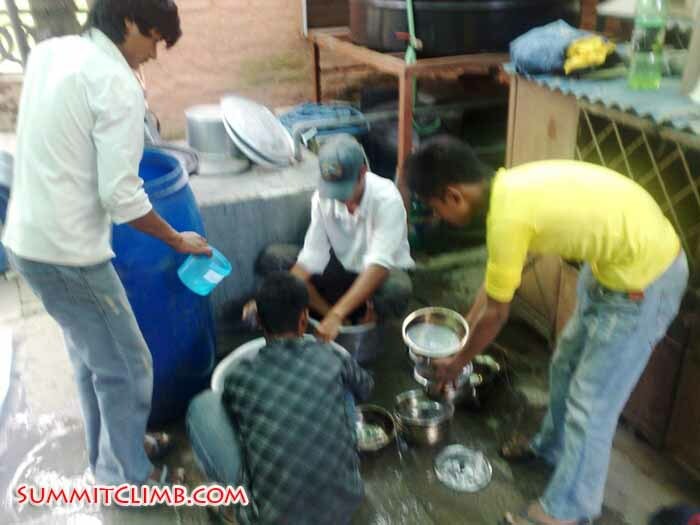 In our high camp we have a small kitchen and staff who take very good care of us. This makes our stay here, even in this bad weather, very easy. They wake us up with tea in the morning, followed by breakfast. When we came back from our hike they served us a delicious lunch and tonight we will be surprised with a tasty dinner again. This way we will stay strong, so if the weather clears we are ready to go high up the mountain. Team on the French pass 5380m during blizzard (Dan Mazur). Well the last few days have been very exciting for the SummitClimb Dhaulagiri Expedition. After arriving in basecamp on the 11th, the members had a lovely few rest days in 4671 metre / 15,320 foot high basecamp relaxing in their warm and cozy private individual tents, meeting up in our very spacious heated and comfortable group dining tent, enjoying delicious freshly prepared meals, watching entertaining dvd's and playing several rousing rounds of cards. During the warm afternoons, we all took hot showers. On the morning of the 13th, we had a blessing ceremony called a "puja" for all of the sherpas and members, where the most religiously knowledgeable of our staff recited prayers and lit incense while sherpas strung prayer flags around the basecamp and everyone drank special tea and ate yummy fresh doughnuts. Our neighbors joined in the Puja as well. 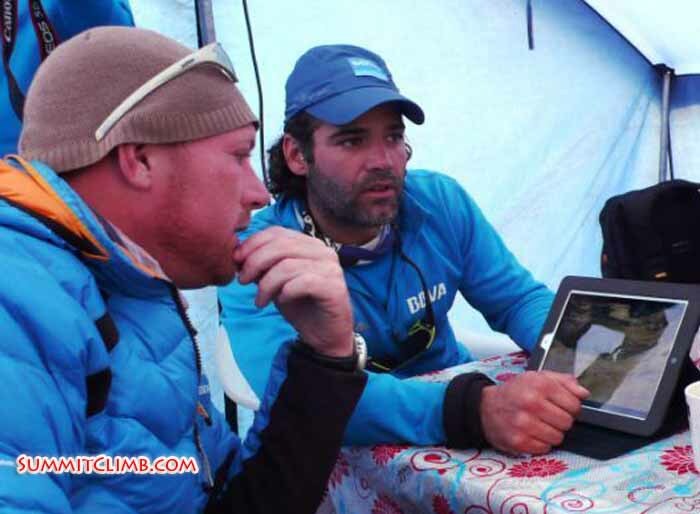 They are a Spanish expedition, working to place Carlos Sorias on the summit of Dhaulagiri. 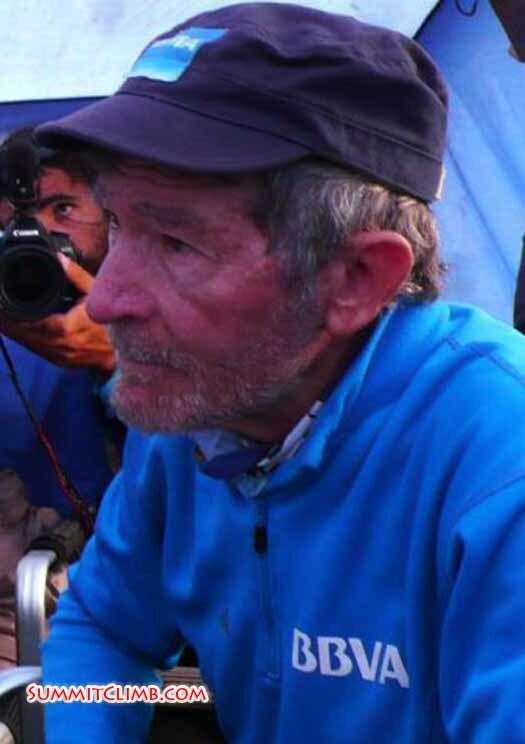 At age 74, he is attempting to become the oldest person to climb all 14 eight thousand metre peaks, and has an impressive support team of sponsors from a Spanish bank, a doctor, camera men, journalists, cooks, guides, and sherpas. On the afternoon of the 13th, our SummitClimb sherpas went off up the Dhaulagiri icefall at 4900 metres to carry and install fixed lines. 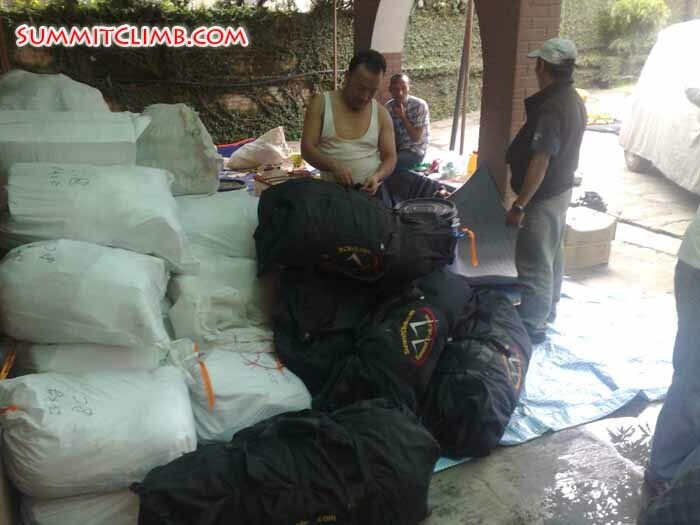 While the sherpas were busy fixing rope, the members prepared all of their climbing equipment, harnesses, ice axes, helmets, etcetera. On the 14th, the members, accompanied by 4 kitchen assistants, 1 cook, and 2 climbing sherpas, climbed up to 5034 metres / 16, 511 feet, in the direction of the French Pass, and made a good camp in a sheltered, dry, flat, rocky valley with a clean flowing stream. This is where I am writing you from at this moment. The plan is to stay up here and acclimate and hike the dry moderate rocky slope up to 5800 metres / 19,024 feet, in order to further acclimate, before we climb through the rocky icefall. We are calling this our Advanced Basecamp (ABC) on the way to French Pass. The trail between BC and ABC was very interesting, at first walking along the white and black ice of the Dhaulagiri Glacier, then the French Glacier, then gaining moraine ridges with inspiring views of the massive North East wall of the Dhaulagiri Massif. The terrain was very easy and there was even a faint trail, cairns, and prayer flags at times. On the afternoon of the 14th, a group of us hung out near the ABC kitchen tent and drank delicious tea and ate soup, while Arnold, Fredrick, Richie, and Chris, explored the higher reaches of the French Pass and the Hidden Valley, all of the way to 5800 metres / 19,000 feet. One of their goals was to see if they could find a higher campsite, to allow for additional acclimatization, however, they said that during their tour, they never saw enough free flowing water to allow a large camp to be established. Nevertheless, they were not able to observe in very much detail the terrain all around them, due to heavy fog, which made their return to ABC, even using GPS, a bit challenging. Fortunately they did arrive before dark. It commenced raining after our very delicious dinner last night and ceased again at around 2 am. 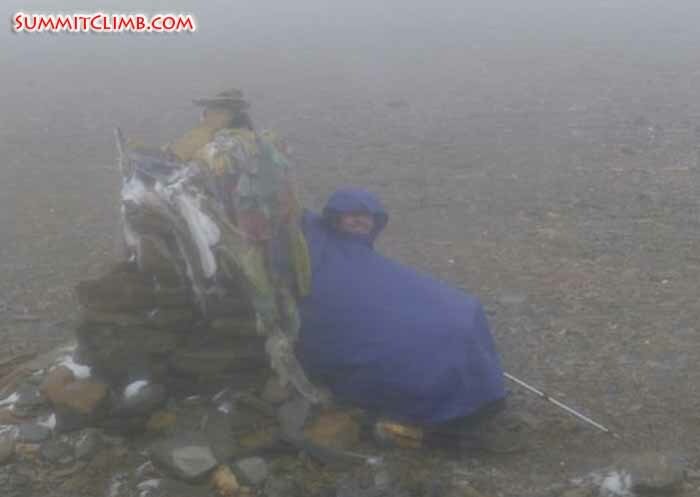 Andrea Rigotti seeking shelter behind Chorten on French Pass (Dan Mazur). TODAY’S TWEET FROM EXPEDITION LEADER DAN MAZUR : TODAY MET CARLOS SORIA, SHARING DHAULAGIRI BC, TRYING 2 BCOME WORLD'S OLDEST 2 CLIMB ALL 14 8,000 METRE - 26,000 FOOT HIGH PEAKS! Yesterday our team arrived in Italian Camp at around 3660m. Today we will have a rest day here and a chance to wash our clothing, shave and just relax. We have an awesome view of a huge waterfall and Dhaulagiri V. Tomorrow we will continue our trek to Base camp at around 4700m. Some of our staff are already up there preparing base camp for us, so if we arrive tomorrow some shelter will be there. So far the trek has been amazing, by far one of the most beautiful treks I've ever done. After a long and bumpy drive to Beni 830m, we were able to drive all the way to Babichour 950m the next morning. A big landslide blocked the road there and we had to start trekking from there. We followed the road through small villages and beautiful rice paddies to Darapani at 1500m, where we spent our first night in tents. The next day we followed a small trail through the jungle to Khibang at 1850m. The trail goes through pretty dense forests, crossing rivers and landslides. Every now and then the forest opens up and we can see the most beautiful waterfalls. The village of Boghara at 2520m is the last real settlement here, after this it's all jungle and mountains. The whole way up we didn't see any other tourists, so this is still the real Nepal! The team is strong and is doing very well. We are a nice mix of nationalities and we have plenty of things to talk about at the dining and breakfast table. Tomorrow we will head off to Base Camp and reach our destination. We are excited to go there and see what our home is going to be for the next month or so. 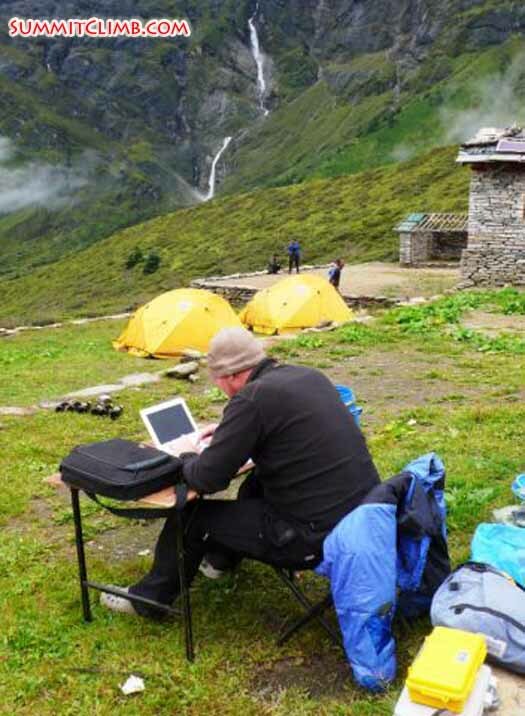 Arnold in the SummitClimb office in 3700 metre high Italian camp with waterfall in background (Dan Mazur). 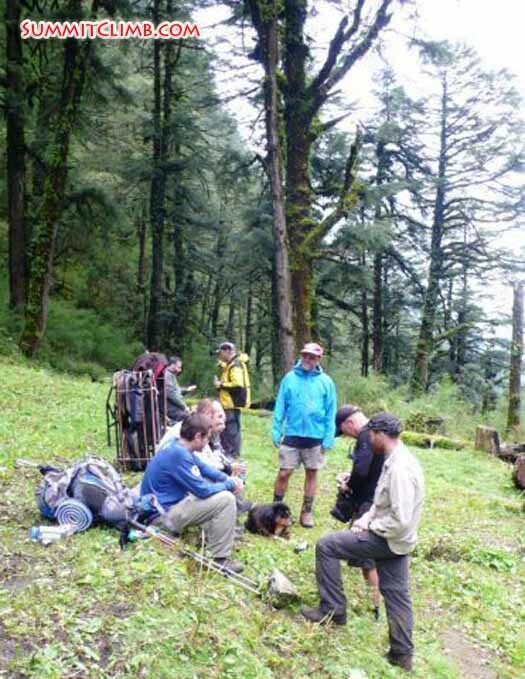 Team resting along the trek in the village of Salaghari please note the giant trees (Dan Mazur). 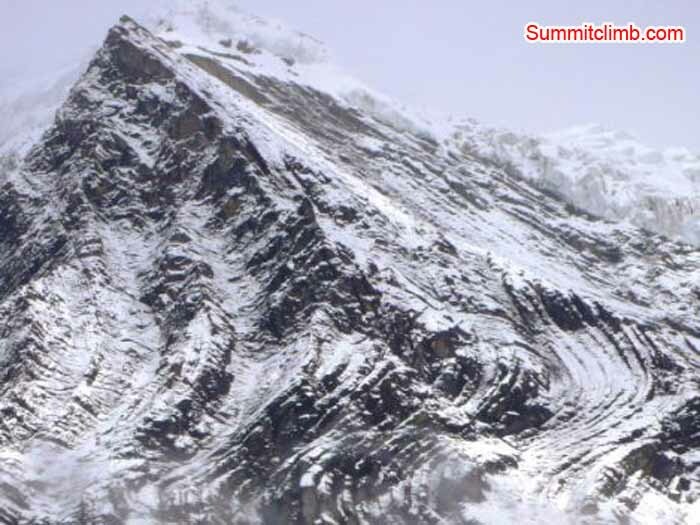 Hi this is Andrea calling with the dispatch for the SummitClimb Dhaulagiri expedition for Saturday 8th September. 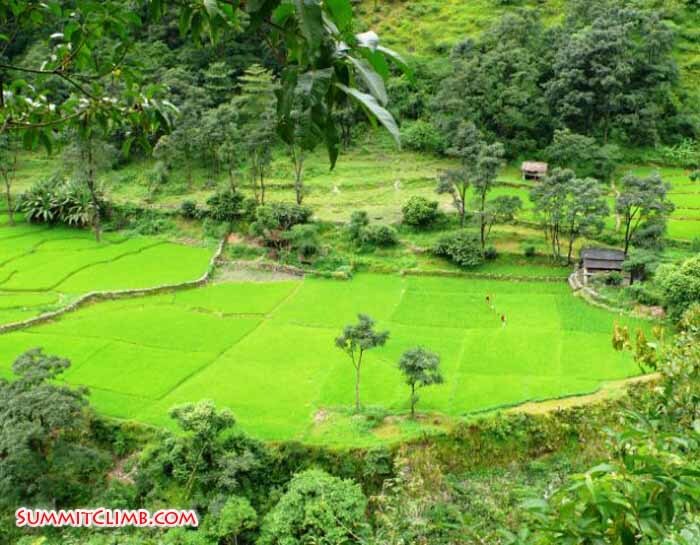 We left the village of Bagar and we had a very beautiful trek across steep terrains with beautiful scenery. We arrived in the village of Doban Kartan at 2520 meters. We all enjoyed the trek, it was very beautiful. When we arrived it was very sunny and it was nice to do some laundry, get refreshed and to chill a little bit. We also have a friendly dog that has been following us on the trip. All of the climbers are in good health and good spirits and we’re all having fun. 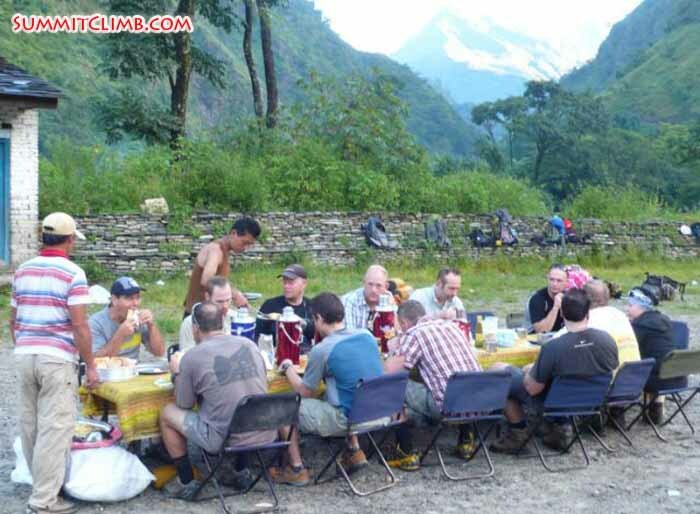 Team breakfast in Durbang School ground with Dhaulagiri 5 in background (Dan Mazur). Hi this is Chris Bailey from Australia giving the Dhaulagiri update for Friday 7th. We left Dobang yesterday morning for another full day of trekking. We followed a really nice trail and haven’t seen any other tourists since we left Kathmandu; it’s really remote out here. It’s very hot and humid and a lot of people look like they’ve been in the river all day; absolutely soaked in water. The trekking is really nice it’s very varied, the tracks aren’t very big and there’s a real sense of remoteness out here. The group started to go a couple of different ways yesterday as well; one group took the scenic route which took a little bit longer but we all arrived in Boghara safely towards the end of the afternoon. A couple of people went and had a shower and a wash in the water pool in the river and everyone was very relaxed in the afternoon. After dinner at night the local school came and gave us a bit of performance with lots of singing and dancing and we were all dragged up to dance along with the group at the end which was very nice. Everyone is very excited at the moment and just really looking forward to getting to basecamp. It’s very enjoyable at the moment everyone is just concentrating on that so we’ll see what happens when we get there. 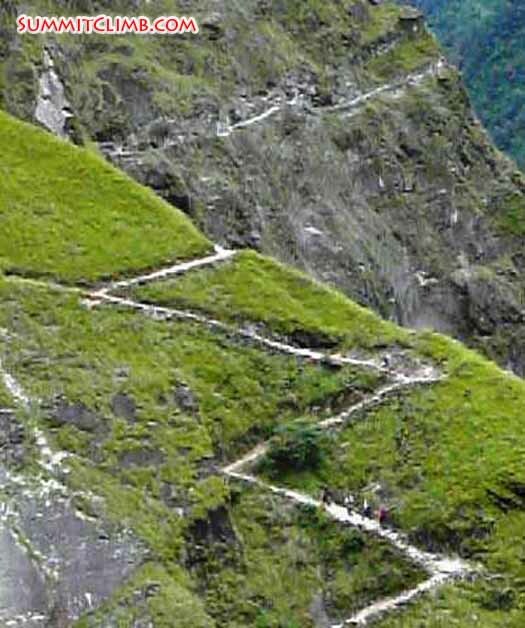 Switchback trail on the trek to Dhaulagiri (Dan Mazur). 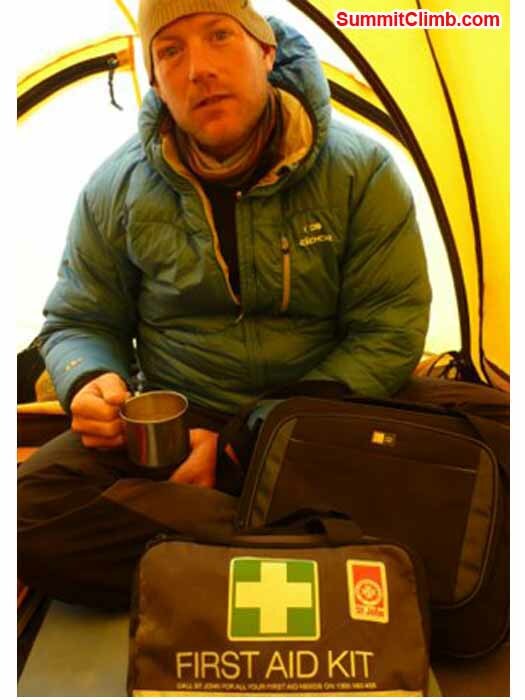 Hi this is Slavo from Slovakia and I’m a member of the Dhaulagiri expedition and I would like to provide a dispatch for yesterday (6th September). We stayed overnight in a village called Dobang. We set up our tents in a football field by one of the schools, it was simply amazing seeing large numbers of people playing football, the local Nepalese guys are really good at football and it was nice to watch. We had a good breakfast and then we set off for the mountains. The weather was good with some sunshine before noon then it was a cloudy afternoon and started raining at about 4pm but it wasn’t that bad. It was a little bit humid; more than most of us are used to. We gained quite a lot of elevation but then we descended down again so overall we gained about 300m but it was a pretty tough job to get up there and downhill. Currently we are in a village called Dobang and we are ready to hit the road. Hello this is Matt Belman with SummitClimb's Dhaulagiri autumn expedition. Yesterday we spent the night at a nice hotel in Beni and had breakfast. Then did a little provisioning and had a few hours bus drive which, was a little bumpy but pretty comfortable. We started walking at the end of the road where the landslide made a path and for a few hours. There was a little bit of heat and after a few hours we stopped off and had lunch at a little settlement along the beautiful Marsyangdi river. The staff prepared a delicious lunch with lots of interesting food, rice and veg and good drinks. We continued to walk along a nice road and trail for a few hours. Some were fast and others a little slower but we all kept ourselves well hydrated as the temperatures were quite warm. The sun stayed hidden behind the clouds so it was nice and cool and we didn’t have any rain. We stopped after a few hours in a town called Darbang. The porters found us a beautiful place to set up our camp in a small yard where many many children came out to meet us, see our tents, cameras and toys/gadgets that we have here. We enjoyed a little bit of internet, another delicious dinner prepared by the SummitClimb staff and then rested. Our altitude is 3800ft / 1200m. Today has started with blue skies and the river is moving swiftly alongside of us. In the distance we can see a 7000m peak, white against the blue sky with a few light clouds. We’ve had our breakfast; eggs and salami and plenty of tea. Now we’re all packed up and ready for another nice stroll for anywhere between 5 to 9 hours. So everything’s well here, we're all feeling good and getting very excited about the trip ahead of us. We’ll be calling in with another dispatch as soon as we can. 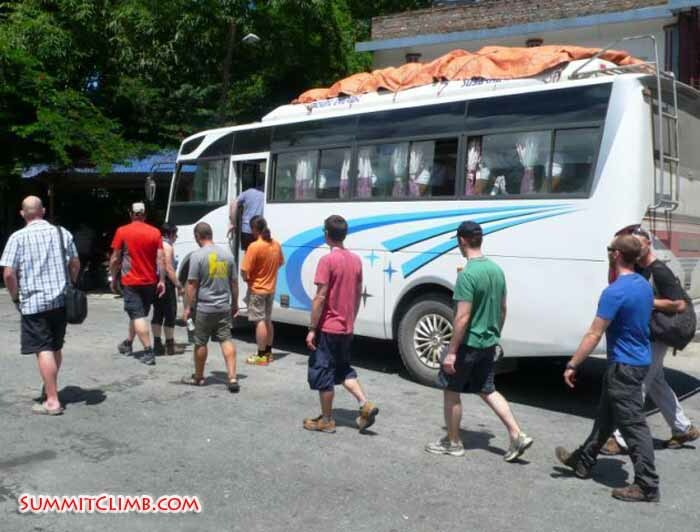 Boarding the bus from Kathmandu to Beni (Dan Mazur). Arnold presents the SummitClimb team donation of funds to Kibang school committee (Dan Mazur). Hi this is Violetta Pontinen speaking, I’m from Poland. 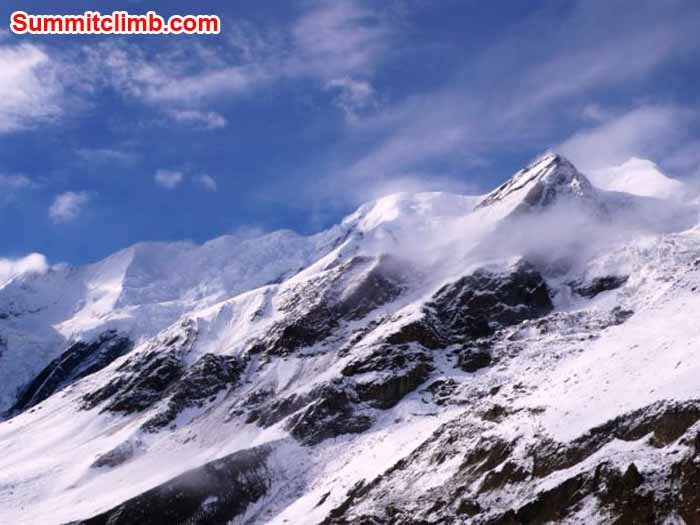 Today is the 4th September and I’m calling with the dispatch for SummitClimb for the Dhaulagiri expedition. We started in Kathmandu very early in the morning and we came to a small village called Beni, which is about 800m above sea level. Our trip was very interesting with absolutely breath-taking views, we crossed a few rivers and a few bridges and although it was a little bit difficult we got to Beni safely and are very happy. We all feel good and admired the views. The trip lasted 8 hours and tomorrow we are going to our next destination. Members on their way to camp 1. 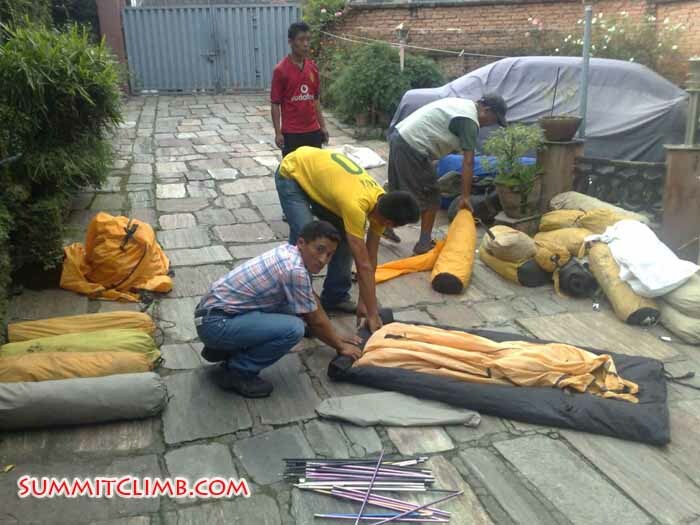 Members and staff packing in Kathmandu (Dan Mazur).